Aztecs used a variety of styles and fashions in their dresses along with different accessories and jewelry types. Some of these accessories were exclusively reserved for the ruling classes and common people were not allowed to use them. One of the most stylish of these accessories was the Aztec headdress which was the exclusive privilege of the upper classes including royalty, nobility, priests and warriors. Just like every other important aspect of Aztec life, Aztec headdresses also had rich religious symbolism associated with them. Aztec headdresses were available in a variety of designs and certain designs were reserved only for certain kind of people. For instance, the Aztec emperor used a headdress whose design could not be copied by anyone else. Similarly, different warrior societies used special kinds of headdresses which represented the specific kind of warrior societies to which they belonged. The headdresses were often adored with precious stones, colours, and metals to further stylise them. Rich symbolism and ritualistic value was associated with Aztec headdresses. For instance, the very shape of an Aztec headdress which formed a disc represented the universe and the sky. Similarly, the feathers used on Aztec headdress were considered sacred and represented the god of feathers workers, Huitzilopochtli. These feather workers were known as “Coyotlinahual” meaning “ones who crafted the feathers”. Aztec headdress was also an important part of the costume that was donned by the priests and the rulers during religious ceremonies and rituals. 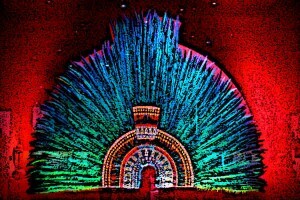 It was customary to use brightly coloured feathers in an Aztec headdress. For this purpose, the quetzal bird was raised for its beautiful blue-green feathers which became part of the headdresses of royalty and the nobility. Specific kinds of styles were reserved for certain people. 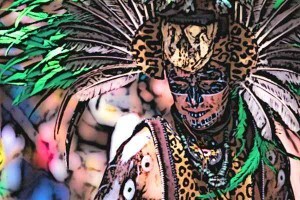 For instance, jaguar warriors used a special kind of feathered hamlets which distinguished them from others. Thus different styles and designs of headdresses were associated with different classes of people. Aztecs made use of a variety of materials for making their headdresses. The most important and precious of these all were the feathers of Quetzal which were exclusively used in the Aztec headdresses of the emperors and the higher nobility. Aztecs raised Quetzal especially to use their feathers in headdresses. A wide range of other materials were also used to decorate the headdresses and this included precious stones, feathers of local birds, beads, shells, and metals. Feathers were the most important and most essential building blocks of an Aztec headdress. Feathers were the most important and most essential building blocks of an Aztec headdress. It was also the kind of feathers used in the Aztec headdresses which determined the social standing of the person wearing it. The most precious kinds of feathers used in Aztec headdresses were that of the Quetzal, a bird that came from the distant rainforest of Central America and which Aztecs raised in particular for the headdresses. Feathers of various local birds were also used for the headdresses of the nobility, priests, and warriors. The warriors used different colours and styles for feathers to represent their specific warrior societies and their position in the military hierarchy. The most magnificent of all Aztec headdresses was the headdress of the Aztec emperor. Feathers of quetzal along with a variety of precious stones and metals were used in this Aztec headdress. The most famous among Aztec emperor headdresses is the headdress of Emperor Moctezuma II who was the Aztec emperor at the time of the Spanish conquest. This particular headdress is made of the feathers of Quetzal and other birds mounted in a base of gold studded with precious stones. This Aztec headdress is 46 inches high and 69 inches across and is made of concentric layers of different coloured feathers arranged in a semicircle. The smallest semicircle is made from blue feathers and consists of small plates of gold in the shapes of half moons. Similarly, the subsequent layers are also studded with precious stones, gold plates, and colourful feathers. Aztec warriors made use of different kinds of headdresses which represented the warrior society to which they belonged and their status in the military hierarchy. Thus for instance Aztec warriors called Cuauhocelotl were given special kinds of feather helmets which distinguished them for their bravery and courage on the battleground. These were the elite warriors known as Eagle and Jaguar warriors. These were the two most important warrior orders in Aztec society and the elite groups for which every soldier aspired. Other than the use of feathered headdresses, eagle warriors also wore the heads of the eagle including an open beak. Leather stripes were also used to cover the legs of the warriors. Aztec priests used headdresses particularly for religious ceremonies, festivals, and rituals. Priests in Aztec society often had largest headdresses with some of them being three feet tall. Often during religious ceremonies priests used headdresses along with certain kind of costumes which represented them as gods. Given the rich religious symbolism associated with Aztec headdresses, they were an integral part of religious ceremonies and special rituals, including the ritual of human sacrifice which was performed by four priests. Priests made use of different kinds of Aztec headdresses during religious ceremonies to honour different gods. Aztecs made use of a variety of accessories along with their clothing and one of the most unique accessories was the Aztec headdress. However, this was one of those accessories that were reserved for the use of the ruling class and the nobility which also included the elite warriors and priests. Aztecs used the feathers of local as well as outsider birds for their headdresses, in particular Quetzal which was especially raised by them for its beautiful and long feathers. Aztec elite warriors such as eagle and jaguar warriors used special headdresses to represent their warrior order and distinguish themselves from other warriors. Priests, on the other hand, made use of headdresses in particular for religious ceremonies, festivals, and rituals. Other than feathers, Aztec headdresses were decorated with a variety of precious stones and metals.